NPO InterCoS together with a visitor from the United States enjjoyed culture programs in Tokyo. NPO InterCoS's annual general meeting was held in Atami on May 19th, and the followings were approved . NPO activities and accounts of previous fiscal year. NPO activity plan and budget for this fiscal year. NPO InterCoS visited Moscow for such as culture programs including space museums. NPO InterCoS's annual general meeting was held in Tokyo on May 15th, and the followings were approved . NPO InterCoS visited Los Angeles and exhanged views on recent space programs with old friends in US. NPO InterCoS's annual general meeting was held in Tokyo on May 10th, and the followings were approved . NPO InterCoS visited Haag for such as culture programs. Joint Conference : 30th ISTS, 34th IEPC & 6th NSAT were held in Kobe. "Cluster Launch of Hodoyoshi-3 and -4 Satellites from Yasny by Dnepr Launch Vehicle" was presented. NPO InterCoS together with other visitors in SDO Yuzhnoye enjjoyed traditional culture programs in Zaporizhia. NPO InterCoS visited Istanbul for culture programs. NPO InterCoS's annual general meeting was held in Tokyo on May 9th, and the followings were approved . The launch of cluster of 5 satellites ASNARO, Hodoyoshi-1, Chubusat-1, TSUBAME, and Qsat-EOS was successfully performed by Dnepr Launch Vehicle from Yasny Launch Base, Orenburg region, Russia, on November 6, 2014 at 10:35:49 Moscow time (07:35:49 UTC). Detailed technical paper "Cluster Launch of Hodoyoshi-3 and -4 Satellites from Yasny by Dnepr Launch Vehicle"
The launch of a cluster of 33 satellites from 17 countries including Hodoyoshi-3 and-4 of The University of Tokyo was successfully performed by Dnepr Launch Vehicle from Yasny Launch Base, Orenburg region, Russia, on June 19th, 2014 at 23:11:11 Moscow time (19:11:111UTC). NPO InterCoS's annual general meeting was held in Tokyo on May 16th, and the followings were approved . All previous Board Members were selected again. NPO InterCoS together with other visitors in SDO Yuzhnoye enjjoyed traditional culture programs in Dnepropetrovsk. Visitors from National Science Academy of Ukraine enjjoyed culture programs in Kamakura and Yokohama. 5th International Nano-satellite Symposium was held in Tokyo. "Environment Monitoring of Fukushima and Chernobyl Areas using a Constellation of Earth Observation Microsatellites" were presented. An teleconference was made between Yasny lauch site and an evening receiption hall. The launch of KOMPSAT-5 satellite was successfully performed by Dnepr Launch Vehicle from Yasny Launch Base, Orenburg region, Russia, on August 22, 2013 at 18:39:13 Moscow time 14:39:13 UTC). A meeting on "Environment Monitoring of Fukushima and Chernobyl Areas using a Constellation of Earth Observation Microsatellites" was held at National Science Academy of Ukraine. Visotors also enjoyed culture programs in Kiev. NPO InterCoS visited Paris Airshow and exchanged views on international space activities and various cooperation possibilities. NPO InterCoS's annual general meeting was held in Tokyo on May 28th, and the followings were approved . The visitors from Kosmotras and SDO Yuzhnoye enjoyed Japanese traditional culture programs in Kyoto. NPO InterCoS visited State Space Agency of Ukraine in Kiev and discussed international cooperation on satellite observation program. Four Earth remote sensing micro satellites being developed by the following universities will be launched by Dneprt launch vehicle at the end of this year. Mr. A. Svotin was selected as a new Board Member replacing Mr. Tomita. All other previous Board Members were selected again. Kosmotras and SDO Yuzhnoye visited Tokyo to discuss satellite launch programs. They also enjoyed culture programs in Japan. NPO InterCoS visited Kosmotras in Moscow, exchanged views on international space activities, and discussed the promotion of peaceful use of rockets. NPO InterCoS participated in the Site Survey of Yasny launch base. NPO InterCoS visited Yuzhnoye in Dnepropetrovsk and discussed the satellite launch programs. 3rd International Nano-satellite Symposium was held in Kitakushu city. Kosmotras presented cluster launch of small/micro satellites by Dnepr launch vehicle. NPO InterCoS visited Moscow Space Museum for the study of Russian space development history. NPO InterCoS's annual general meeting was held in Tokyo on May 20th, and the followings were approved . NPO InterCoS visited National Space Agency of Ukraine in Kiev and discussed international cooperation on space activities and satellite launch. The visitors from Kosmotras and SDO Yuzhnoye enjoyed Japanese traditional culture programs in Nikko. NPO InterCoS visited St. Petersburg for the study of Russian culture and history. Also the visitors from Alcantara Cyclone Space and SDO Yuzhnoye enjoyed Japanese traditional culture programs in Kyoto. OICETS/INDEX Launch support team gathered together in Tokyo to celebrate 5th anniversary of OICETS launch. NPO InterCoS visited National Space Agency of Ukraine in Kiev and discussed cooperation possibility on satellite remote sensing . NPO InterCoS participated in the kick-off meeting on the Launch program of Nano-JASMINE satellite using Cyclone-4 launch vehicle. Facility tour was made. NPO InterCoS's annual general meeting was held in Tokyo on May 13th, and the followings were approved . All the previous Board Members have been selected again. Mr. Mike Gold, a corporate counsel of Bigelow Aerospace in the USA, visited Tokyo and exchanged views on future US space policy with NPO InterCoS. DubaiSat-1, UK DMC-2, Deimos-1, NanoSat-1B, AprizeSat-3 and AprizeSat-4 were successfully launched into orbit. OICETS Launch support team gathered together to welcome Ms.Nastya Berezhna to Tokyo. At 6:37 UTC the Dnepr rocket lifted off from Yasny Launch Base in Orenburg Region, Russia. THEOS, a remote sensing satellte satellite for Geo-Informatics and Space Technology Development Agency of Thailand (GISTDA), was successfully launched into orbit. It was the eleventh launch of the converted SS-18 ICBM carrying commercial payload under the Dnepr Program. The Dnepr rocket lifted off at 7:15:58 UTC from Baikonur Cosmodrome Site 109. The RapidEye satellites were delivered into their target 630km sun-synchronous orbit. The injection was nominal with all systems operating properly. The international program to launch a Nano-JASMINE satellite by a Cyclone-4 Launch Vehicle is reported on major newspaper in Japan including The Yomiuri, The Asahi, and The Nikkan Kogyo. Mr. Mike Gold, a corporate counsel of Bigelow Aerospace, USA visited Japan and presented Bigelow Aerospace's activities to develop commercial space stations in the panel session "Future of Space Tourism" of the International Symposium of Space Technology and Science(ISTS). Mr. Gold has been supporting NPO InterCoS since the first cooperation at Yasny Launch Base. Future cooperation program was discussed. The Alcantara Cyclone Space Binational Company is building launch facility for Cyclone-4 rocket at the Alcantara Launch Center in Brazil. The Cyclone-4 will enter into operation in mid-2011. University of Tokyo, National Astronomical Observatory of Japan, Alcantara Cyclone Space and SDO Yuzhnoye have signed an MOU that outlines plans for cooperation on launching Nano-JASMINE Satellite by Cyclone-4 Launch Vehicle from Brazil. NPO InterCoS visited Japanese Embassy in Kiev and exchanged information about Ukraine including NPO InterCoS's activities on a new satellite launch program. NPO InterCoS visited National Space Agency of Ukraine in Kiev and exchanged views on international space activities and discussed a new satellite launch program. NPO InterCoS visited Yuzhnoye Design Office in Dnepropetrovsk, Ukraine and discussed a new satellite launch program. Facility tour was made. 2007-08-01: Pen magazine "into the SPACE"
Pen magazine featuring "into the SPACE" was published. NPO InrerCoS supported Pen magazine reporters to gather data on Russian space activities in Moscow. According to the latest information from Yasny, Genesis-2 was successfully launched by Dnepr launch vehicle from Yasny base at 15:02 UTC of 2007-06-28. The German radar satellite TerraSAR-X was launched successfully from Baikonur Cosmodrome at 02:14 UTC. On April 17, 2007 at 10 hours 46 minuets Moscow time, a converted SS-18 ICBM (commercially known as Dnepr) was launched from Baikonur Cosmodrome. Shortly thereafter the rocket successfully deployed 14 satellites into a 640 km Sun-synchronous orbit. NPO InterCoS participated in a survey team of "RD & PE Zvezda" JSC near Moscow, a world leading manufacture of Spacesuits and Life Support Systems. NPO InterCoS visited National Space Agency of Ukraine in Kiev and exchanged views on international space activities and discussed cooperation possibilities. NPO InterCoS visited Japanese Embassy in Kiev and exchanged information about Ukraine including NPO InterCoS's activities on space and culture . NPO InterCoS visited RSC Energia in Moscow, discussed the cooperation in the promotion of Russian space activities, and revisited Energia Space Museum. NPO InterCoS visited Federal Space Agency of Russia in Moscow and exchanged views on international space activities. Renovated Energia Museum is photo reported by NPO InterCoS. NPO InterCoS surveyed Odessa, Ukraine where Mr. Korolev, the Father of Russian space development, spent his young days. NPO InterCoS visited Yuzhnoye Design Office in Dnepropetrovsk, Ukraine and discussed the potential cooperation in the area of space. Facility tour was made. NPO InterCoS visited RSC Energia in Moscow for the cooperation in the promotion and popularization of Russian space activities. By the special courtesy of RSC Energia and Federal Space Agency of Russia, NPO InterCoS surveyed renovated Energia Space Museum and interviewed with Mr. Chertok, the legend of Russian space development history. NPO InterCoS visited Kosmotras in Moscow and discussed the promotion of peaceful use of rockets. NPO InterCoS had a meeting with Khrunichev Space Center in Moscow and introduced NPO InterCoS. Cooperation in the promotion and popularization of Russian space activities was discussed. NPO InterCoS visited Japan Aerospace Exploration Agency (JAXA) in Tokyo and introduced NPO InterCoS. NPO InterCoS visited National Space Agency of Ukraine in Kiev and introduced NPO InterCoS. Cooperation in the promotion and popularization of Ukrainian space activities was discussed. NPO InterCoS visited Federal Space Agency of Russia in Moscow and introduced NPO InterCoS. Cooperation in the promotion and popularization of Russian space activities was discussed. 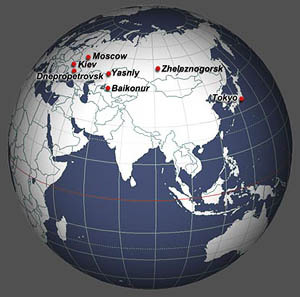 As only one special foreign guest, NPO InterCoS was invited to the first Dnepr launch, from new Russian Yasny Launch Base, of Genesis 1 spacecraft produced by Bigelow Aerospace in the U.S. (launch at 18:54 of July 12, 2006, Moscow time). InterCoS surveyed the satellite processing facility, accommodation, and residential area of new Russian Yasny Launch Base. InterCoS's Board Meeting was also held in Yasny. NPO InterCoS was authorized by government on 17th of May, 2006 based on NPO law in Japan and was officially established and registered on 24th of May, 2006. Application documents requesting for government authorization as Non Profit Organization for Promotion of International Peaceful Cooperation in Space was submitted in Tokyo. First project meetings to start NPO volunteer activities for international cooperation in space were held in Kiev, Moscow, and Yasny. NPO InterCoS is a Non Profit Organization for Promotion of International Peaceful Cooperation in Space. NPO InterCoS was established and registered in Tokyo with government authorization based on NPO laws in Japan. It introduces the Space Activities and Culture of such countries of Russia and Ukraine to the world, and promotes the cooperation with them. It also promotes peaceful use of Rockets. A new web-site specialized in the NPO activities for Culture and Art is being prepared at www.npospace.jp, www.photoartspace.com, and www. balletspace.com . This page is prepared by NPO InterCoS. Other than noticed individually, NPO InterCoS has Copyright of this page.